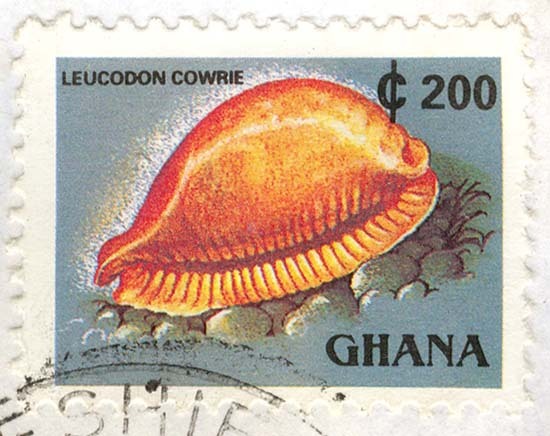 Article 93: Ghana Green Card Correspondence In this first selection, I show usages of the 200 c Leucodon Cowrie Sea Shell. I show major color variations of the stamp, a selection of several postmarks, two covers (arbitrarily numbered 4 and 8), a selection from a cover with a missperfed vertical pair, and covers and selections from covers for four cities: Accra (the capital), Kaneshie, Kotokuraba, and Swedru. Article 105: Ghana Green Card Correspondence (Part 2) This is the second installment of images from the Ghana Green Card correspondence. Quick links: images of the two stamps, covers and selections from covers for the 400c Butterfly and the 400c Shell. Article 113: Ghana Green Card Correspondence Here are a few modern definitives from Ghana on a single correspondence. Quick links: 50 cents on cover, 100 cents on several covers.